There is a restaurant in Berlin called the Cafe Adler, a dim, smoky joint perched on a corner directly opposite what was once Checkpoint Charlie. It’s a smallish place, with two rooms arranged shotgun style, one behind the other, and clouded plate glass windows that look out onto a scene of persistent construction. It rains a lot in the autumn in Berlin, and the dampness and the smell of old raincoats mingle with the cigarette smoke. The waitresses are brisk and self-absorbed. The menu is scrawled in chalk on a blackboard that hangs over diners like a Departures sign in a railway terminus. You can try the lentil soup, and you won’t be disappointed. But the real purpose of snagging a table at the Cafe Adler is to order a Pilsner or a whiskey or a sherry and sit cheek by jowl with history. Drink in its fumes. Stare through the windows made yellow by decades of brown coal smoke, and consider what was once the last frontier: the border crossing between East and West that Berlin, in its rush to enter the twenty-first century, has now swept under an asphalt mat and called an office park. Checkpoint Charlie: the floodlit, barbed-wire exit for desperate men, the ones who’d turned on their trench mates and best friends, the ones who knew that all allegiance and belief were ultimately pointless; refugees from the Cold War, crossing from one enemy to the next in a burst of machine-gun fire. I went to the Cafe Adler looking for John le Carré, though I’m sure he never goes there anymore. Decades past, when le Carré was just another David Cornwell serving the British Empire in the discreet fashion of what he called the Circus, he is said to have occupied a particular table near the windows of Cafe Adler: le Carré as spectator, as informed observer of the crossings from West to East. The story may be apocryphal, of course. But I like to think of the young Cornwell sitting there, knocking back something raw and wet, and dreaming of a quiet, fussy, bespectacled man in a bowler hat and the dark grey uniform of the English civil servant. George Smiley: eminence grise with his ear to the ground. A faint and defeated cuckold. A character for our age. It is impossible to think of espionage, real or the stuff of fiction, in the context of lentil soup. George Smiley understood that. When he approached one of his Joes—le Carré’s term for an agent in the field, an asset in the parlance of the CIA—it was in a featureless room that was blandly comforting and utterly without identifiable quirks, much like Smiley himself. He would offer the man a drink: vodka for the Russians, schnapps for the Germans, good Irish whiskey for the honorable schoolboys closer to home. The fear and the sense of being hunted and the certainty of death would recede, and for the space of a few hours the Joe was allowed to come in from the cold. He’d sip the reviving fire and believe again in friendship and find a purpose in his cloak-and-dagger life. He’d tell Smiley everything that Smiley already knew, and seal his peculiar fate. I write spy novels myself. I go looking for characters in places like the Cafe Adler, in the Bamboo bar of Bangkok’s Oriental Hotel, in the haunts of Istanbul and St. Petersburg and even, occasionally, New York. There is a persistent clubbishness about espionage that finds its native ground in the half-lit interiors, the murmured talk, of the oldest watering holes in the world. The club was born in the days of British Empire, when officers who were always gentlemen thought it their duty to read the Enemy’s private mail. It reached fighting weight in the clubs of Pall Mall and Yale’s Skull and Bones, in the confines of Princeton’s Cottage Club and Harvard’s Hasty Pudding. I know this from a lifetime of reading Ian Fleming and Earle Stanley Gardner and le Carré—but also from experience. I spent four years at Princeton and another four at the CIA. Truth be told, women populate the clandestine landscape as thickly as men. But women are not always admitted to exclusive clubs, and even more rarely to the literature of spying. Le Carré’s women are usually victims; Fleming’s are always babes. They stumble in their high heels, arms outstretched, and die on the word James. Women are not the point of the safehouse and the glass of whiskey; they live on the fringe, in the bedroom and near the hearthfire. They are never in control. 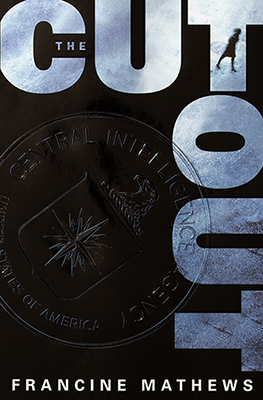 It’s hard to love spy fiction as a woman in America. The club doors are closed, and we’re all out in the cold. I reflected on this truth last year as I drove to a signing event for my spy novel, The Cutout—researched in the twilit lull of the Cafe Adler. A man named Robert Philip Hanssen had been arrested for treason earlier in the day. And when I arrived at the bookstore, the television cameras were waiting. As a former habituee of the covert world, I was expected to explain Hanssen’s behavior for the local viewing public. I answered the questions as best I could, but the deeper issue demanded something more thoughtful than a sound bite. Pundits the length and breadth of the country will spill gallons of ink over Robert Hanssen, as they’ve done for all the moles and turncoats before him. What drives a man—and it is almost always a man—to risk everything? To betray his friends, his family, and all he professes to believe, just to sell a few secrets? It’s not just the money, though the money’s good. It’s usually the same things that sent him into the clandestine world in the first place: a simultaneous yearning for, and hatred of, membership in the most exclusive club in the world. Hanssen was a classic joiner—of the FBI, and then of its cadre of spy catchers; of the Catholic Church, and within it, a cabal considered elitist even in Rome. Part of the fascination with secret societies is the sense of power derived from knowing more than your neighbors. Secrets—and the people who sell them—have the power to shape events, the power to change history, the power to end lives. Robert Hanssen knew enough secrets to wield considerable clout: he could circumvent and outwit, protect or betray the people who trusted him. He could hunt Russians by day, and take their money by night. Perhaps most importantly, he could believe himself cleverer than the rules he selectively enforced. For Robert Hanssen, turnings the boys’ clubs on their heads was the point of the whole game. But such clubs, once penetrated, lose their mysterious appeal. Loyalty and faith go unrequited. Membership is accorded to the unworthy. Affection palls. The search for a better club begins, a club so exclusive it contains only yourself. Hanssen’s tastes brought him, in the end, to that charmed circle le Carré described so often: a room just big enough for Smiley and Joe, agent and handler, and all the cold the doorway lets in. No good writer can resist the story. It has bathos and pathos and enough double-dealing to sell movie rights the world over. If le Carré were writing this, Hanssen would turn out to be just another shill—a sacrificial lamb blackballed by his final club to protect a spy far more potent and deadly. The Russians would have presented him to the FBI as a gift, a decoy, while the real mining of secrets continued in the room next door. Le Carré’s tunneling mole would be a tough male member of the Western power structure, a man equally intimate with Langley or No. 10 Downing Street or the halls of the Kremlin. My ending, however, would be quite different. I’d remember the women who taught me my job at the CIA. The way I carried a particular shade of lipstick in my ammo belt as I rappelled off a helicopter skid with an M16 strapped to my back. I’d remember the blond Dolly Parton wig and rhinestone shades I wore to a meeting with a terrorist. And then I’d get down to work. Sit back in your chair with a full-bodied red, or a single malt scotch, smoky with peat. Turn the glass in the glow of the fire and lend me your ears. I’d like to tell you a crackling good tale. Only this time, my friends, it’s about someone the men’s clubs forgot. She’s smart and she’s tough and the old boys never see her coming. You can call her the Babe Who Came in From the Cold. 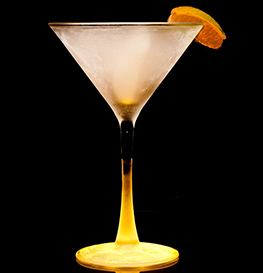 Strain into a martini glass. Add a slice of orange.